As many subscribers have reminded me, if Phil’s understanding of the Rules was as good as he claimed, he would almost certainly have been better off waiting for his ball to come to rest behind the bunker, then picking it up and replacing it on the putting green where he had just putted from, for a single penalty stroke, under Rule 28a or Rule 27-1. I have mentioned this option many times in previous blogs, including this one, titled ‘Stroke and Distance Penalty’. Q. On the teeing ground, a player broke off a branch of a tree which was interfering with his swing. The player maintained that such action was not a breach of Rule 13-2 because his ball was not yet in play. Was the player correct? A. No. The player was in breach of Rule 13-2 for improving the area of his intended swing. Although Rule 13-2 allows a player to eliminate irregularities of surface on the teeing ground, it does not allow him to break a branch interfering with his swing. The penalty would apply even if the player, before playing his next stroke, re-teed elsewhere on the teeing ground - see Decision 13-2/24. Note that had the fescue, or any other irregularity of surface, been within the teeing ground it could have been tapped down or removed, without penalty. The whole incident, including the confusing commentary by Brian Bateman and Robert (?) 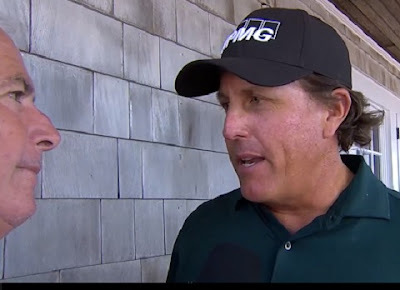 and the on-course dialogue between Phil Mickelson and Robbie Ware, can be viewed at this PGA Tour link. (Pay special attention to the commentators’ uninformed and confusing analysis!). After this event, on its social media accounts, the PGA Tour tried to emphasise the positive by saying that this was another incidence of a player calling a penalty on himself. That is not quite how I saw it! Unfortunately, this episode provided yet another example of TV golf commentators, who presumably make a good living from their chosen profession, continuing to embarrass themselves by not having a clue about the correct ruling for occurrences that are just slightly out of the ordinary. Surely, they have enough ‘off-air’ time that they could usefully spend brushing up their Rules knowledge. The mind boggles as to what it will be like next year when the new modernised Rules come into effect! Returning to Phil Mickelson, who brought this spotlight on himself with his earlier claim that he knows the Rules, I am pleased to partly redress the balance by drawing readers’ attention to another interesting Rules incident from two years ago, when he did take advantage of a fairly obscure Rule on the par-5 18th hole of Torrey Pines North course. Click here for a short video of the situation (that follows the ad). Phil Mickelson features in other Rules incidents in my book, ‘Pros Getting it Wrong!’ that contains 99 articles on memorable Rules of Golf incidents, most of them relating to golfers competing in Professional Golf Tour events. Each of the wide ranging articles highlights a breach of a Rule of Golf with interesting nuggets of information, including explanations of the rulings, comments from the players and officials concerned, links to videos showing the circumstance of the breach and the consequences of the penalties imposed. Click here to purchase the eBook file from me, or if you prefer a paperback, it can be purchased from Amazon (a more expensive option). The above content is strictly copyright to Barry Rhodes © 2018 and may not be copied without permission.